"The Big Picture" - 2018 book re Hollywood economics - movies = de facto TV episodes! In the past decade, Hollywood has endured a cataclysm on a par with the end of silent film and the demise of the studio system. Stars and directors have seen their power dwindle, while writers and producers lift their best techniques from TV, comic books, and the toy biz. 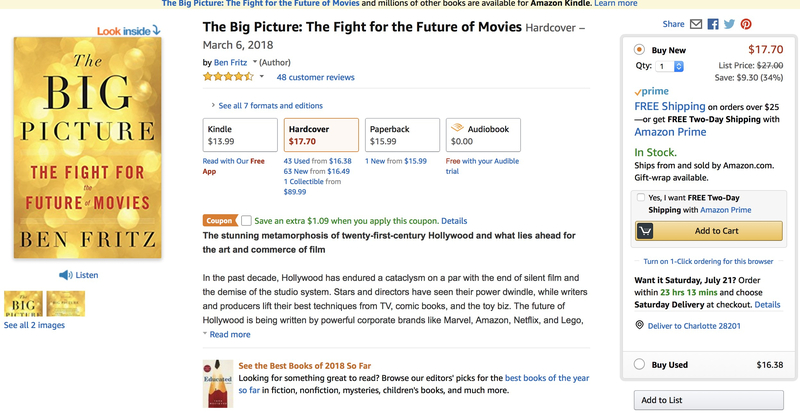 The future of Hollywood is being written by powerful corporate brands like Marvel, Amazon, Netflix, and Lego, as well as censors in China. Ben Fritz chronicles this dramatic shakeup with unmatched skill, bringing equal fluency to both the financial and entertainment aspects of Hollywood. He dives deeply into the fruits of the Sony hack to show how the previous model, long a creative and commercial success, lost its way. And he looks ahead through interviews with dozens of key players at Disney, Marvel, Netflix, Amazon, Imax, and others to discover how they have reinvented the business. He shows us, for instance, how Marvel replaced stars with “universes,” and how Disney remade itself in Apple’s image and reaped enormous profits. But despite the destruction of the studios’ traditional playbook, Fritz argues that these seismic shifts signal the dawn of a new heyday for film. The Big Picture shows the first glimmers of this new golden age through the eyes of the creative mavericks who are defining what our movies will look like in the new era.